Can My Ferret Eat Fruit? | Can i Give My Ferret? 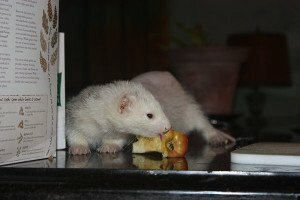 Can My Ferret Eat Fruit? Can you give your ferret fruit? In the past the best choice for giving ferret food, when unavailable was high quality cat or kitten food. Now, with more and more people opting to own ferrets as pets, there is a growing commercial supply for ferret diets available. Some are better than others and ferret food, with more protein and leaner in diet would tend to be more expensive, but they are worth it. The lack of truly ideal ferret foods is one reason there is growing interest in more natural diets for ferrets. For those that would need to compromise on the cost, as a second option, to be honest, the less healthy alternative would be to give very high quality cat or kitten food. You should mix this in with ferret food so that the nutritional value, especially the protein content will increase. Should you be changing your pet’s diet, o it gradually by mixing in the new food with the old product and gradually reducing the old diet while increasing the new item. Since the digestive system of ferrets is not designed to process anything other than meat, it will be harmful for your ferret to process fruits. Sweets or anything that has sugar contain complex carbohydrates and a ferret’s strictly carnivorous digestive tract cannot process these foods. Diets high in carbohydrates may lead to intestinal problems and some types of cancer. Ferrets, as obligate carnivores, must eat animal protein to survive. Given this reality, the best treats to feed a ferret are those which are meat-based. Usually, it’s not best to rely on store-bought treats because many are labeled as appropriate and healthy for ferrets but maybe meant more for cats or dogs. As an alternative, you may give small amounts of Gerber® or Beech Nut® chicken, beef, or turkey baby food (with no vegetables or starches; gravy is okay), cooked chicken breast (or other cooked meats), and freeze-dried 100% meat products. Refrain from giving table scraps or meats cured with salt, such as many jerkies. Although some ferrets might enjoy fruit or other sweet vegetables, they should be avoided. Dog biscuits, designed for smaller dogs may also be a good treat but be weary and read what’s on the label so you can choose the healthiest option for your pet. Do not give chew toys or chew hides and when giving treats, cut or break them off into small pieces to avoid chocking, blockage or overfeeding. Avoid dairy products and dried fruits as ferrets are somewhat lactose intolerant and dried fruit is difficult to digest. You should also avoid nuts and grain products, as the animals cannot digest these, and treats that could be swallowed whole, as ferrets do not have grinding molars like us. As you have said Ferrets are carnivores. They eat meat and a raw meat diet is best for them or a kibble/dried food with a high meat content. Ferrets do not and should not eat fruits,dairy, vegetables or grains, they cannot digest these at all. Fruits contain a high amount of natural sugars that can lead to insulinoma adrenal and other fatal diseases. Ferrets are not found in the wild, and wild animals do not eat their preys stomach contents, this is usually discarded. While a lot of the information that you give is very good, some of it is very misleading and simply not true. Not good when new ferrants could be looking here for helpful advise.